Photography is all about trying to capture the truth of your subject. Whether it’s a person’s face, an abandoned city building, or a sprawling natural landscape, all photographers aim to capture their subjects as they truly are. With nature this task is hard. After all, how can a still and lifeless photograph capture the roar of a waterfall, or the stillness of a sunrise? It takes a good eye, a steady hand, and a lot of patience. But nature becomes even more difficult as night rolls in. Light is both a photographer’s friend and worst enemy. You have to know how to harness it, how to manipulate it, how to do without it, and how to simulate it when it isn’t there. Whether it’s low light photography that you are dealing with, or how to take the perfect night sky photography, you can always use a few tips on dealing with light. Here are three easy night photography tips to improve your night photos in a snap. 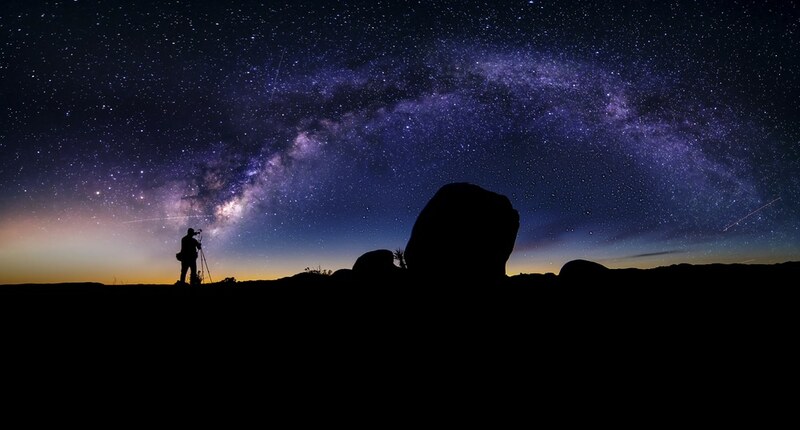 Capturing a beautiful night sky requires patience, perseverance, a thermos full of hot coffee, and most importantly, the right camera equipment. While you’ve probably seen plenty of Instagram feeds of stunning photos taken with nothing more than an iPhone, the avid nature photographer takes camera equipment seriously. To take the best night photos possible, you’ll want a full-frame DSLR camera, a fast speed, wide-angle lens like a rokinon 14mm night photography lens, a sturdy tripod, a shutter release remote, and star map, or stargazing app. When you’re photographing the night sky you’re trying to capture both the beauty of the stars, and the beauty of specific surrounding landmarks. In order to do that properly, you need to have a clear understanding of where stars, constellations, and other points of interest will appear in the night sky. You also need a clear understanding of how that position relates to your targeted landmark. For example, if you want to photograph the Galactic Center of the Milky Way, you’ll have to point your camera due South. To capture your desired landmark like say, a mountain range, you’ll therefore have to be North of the landmark in order to capture them both in one shot. That means that composing your shot takes planning and preparation. For that, you’ll want to arrive at your destination and get set up way in advance of sun down. To avoid fumbling around in the dark trying to get your camera to cooperate, it is easier to know the best camera settings before you set out, and have them already dialed in. To get those proper settings you’ll need to adjust the aperture, the shutter speed, and the ISO. This can sound a little daunting if you’re new to photography, but the concepts are simple enough. The aperture is how wide the lens opens depending on how much light needs to enter the lens. It might be helpful to think of the aperture the same way you would your pupils. They need to open wider to let in more light in darker conditions, and that’s exactly what you’ll do with the aperture of your camera in low lighting. The shutter speed determines how long the shutter stays open, which in turn determines how much time the lens has to capture light. You’ll want the shutter open longer to capture more light for your night sky photos, but you’ll have to balance that time with the movement of the Earth. When the shutter is open longer it captures movement as well as light, and that’s how you end up with star trails. Something you may or may not want. And finally, the last important setting for night photography is ISO. What is ISO on a camera? ISO measures your camera’s sensitivity to light, and it is the setting that has the most impact on the quality of your images. Cameras produce better images when the ISO is lowest, but to take night photographs you need a high sensitivity to light, and therefore a high ISO. This is where you circle back to having the right equipment. If you have a full frame camera, with a larger sensor, you can get more sensitivity to light without sacrificing image quality. It’s important to spend some time fiddling with your camera settings and adjusting them for the best possible outcome and the best balance between the light you need and the image you want to capture. Once you have acquired the right equipment, thought out the composition of your shot, and experimented with the proper camera settings, you’ll be taking better night photography in a snap. Or is it a flash?